Do you have kids who stress out and hate pressure? I sure do. My husband and I both LOVED flashcards as kids. My mom would drill us at home constantly & I remember enjoying every second of playing round-the-world in elementary school. Maybe because I’m competitive, love a challenge, being on “stage”, and have always been quick at math facts. Hmmm. Now that I think about it, that game probably wasn’t very fun for the majority of the class. But I digress. My children loathe flashcards. It is their absolute least favorite thing to do. So what’s a math drilling momma to do? Figure out a game that gets in the same practice, without the “pressure”. Clearly we need some character lessons on what real struggles and pressure look like, but sometimes, I just want to get the stinking math in any way I can. Enter Forehead Math Master. 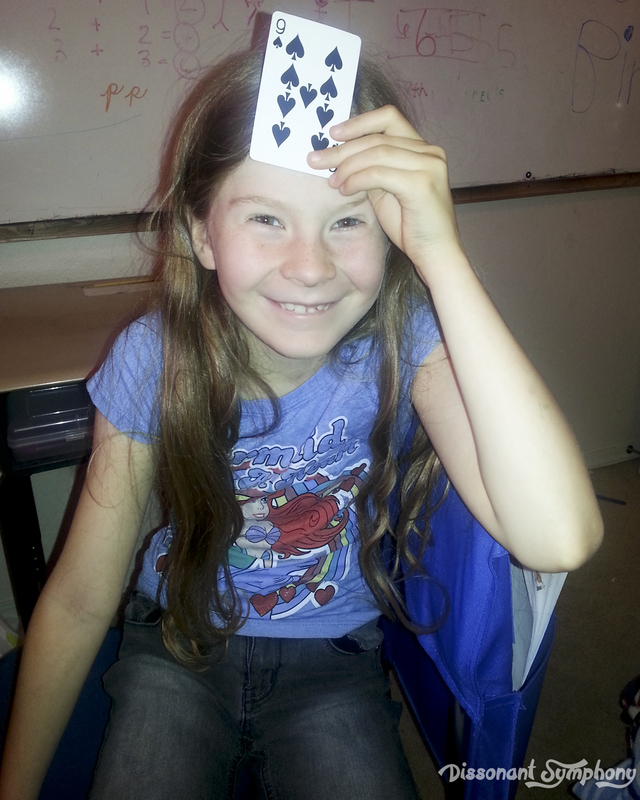 All you need to trick kids into math fact practice is a deck of cards. You can play this game to drill addition, subtraction or multiplication facts. This game (in my opinion) is more challenging than flashcards in that it forces the players to extrapolate answers with only a partial set of addends or factors. More brain stimulation while masquerading as a game? Yes please! 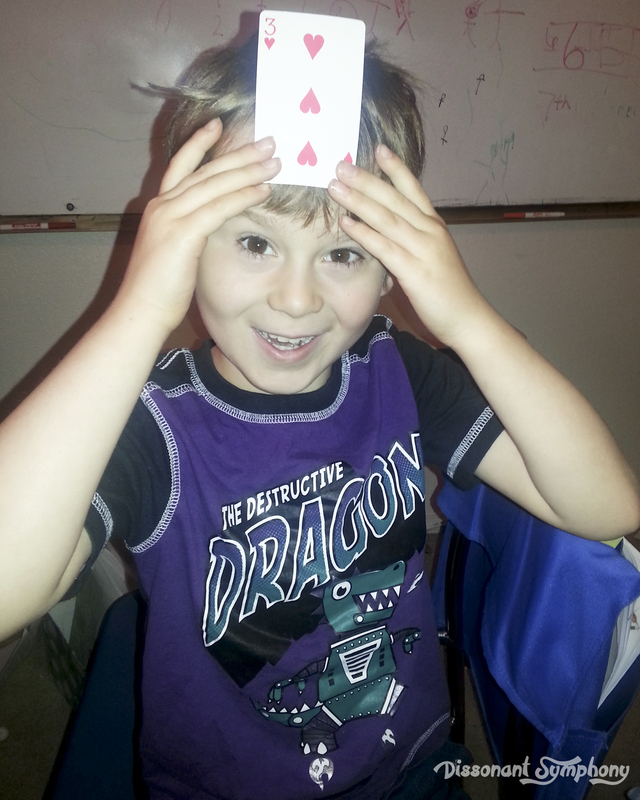 Each player places a card on their forehead, facing the other player. Like so. When I’m playing with my kiddos, I do one at a time since they are at different levels. I play as the second person and my munchkins simply tell me what the card on my forehead is. I then give them the sum/product/difference of our two cards and they have to figure out what their card is. If you have multiple kids (or a class) who can compete against each other – ya’ know, if that isn’t too stressful – you can play judge and only tell the sum/product/difference instead of being the second person with a card. Then whoever gets the fact first keeps the cards and the person with the most at the end of the deck wins. This game is extremely adjustable to varying skill levels. My 6-year-old and I play with all the face cards as 10s and just addition. My older daughter gets Jack, Queen and King cards representing numbers 11-13 as well as multiplication. As they progress, I’ll begin rotating through addition/subtraction/multiplication all together during the game and the kids will have to figure out what math skill answer I’m giving. If you keep a deck of cards in your purse (or am I the only one who does that? ), this game enables math practice wherever you happen to be running off to during the day. Enjoy!